What is the objective of armed conflict? The answer, in its purist form is to impose will. This means to impose our will upon our opponent, both for brief moments of time and for a lasting duration. Imposing will for a lasting duration is decidedly not a military objective – at least not solely a military objective. That would require the influence of diplomatic, economic, and informational coercion. However, to impose will for brief moments of time is very much a military objective of armed conflict. Imposing will begins at the tactical level. Each opponent attempts to force the other to yield terrain, facilities, material resources, or influence over an indigenous population. Tacticians tend to think of this in terms of purely attrition – that is, shooting more numbers of the bad guys than they can shoot of friendly forces. And attrition is certainly a factor, though there are more decisive and progressive means of imposing will. Consider two incidents within your own repertoire of experiences. Remember the last time you waited weeks to get back out into the field? You spent a couple hours prepping for the mission and searching for the enemy. And at the first sound of the firefight, everyone dove for cover and – nothing. No assaulting enemy. No mad push through to overwhelm an enemy patrol. There was just a short burst of fire and now complete silence. You look around to see another member of your patrol peering through the vegetation to try to get a fix on what’s going on. This is called the ‘bunker-down’ effect. It is not decisive. And in fact, it is most often a tactical error in which the friendly patrol hopes to win through attrition. But hope is not a plan, nor is it a combat multiplier. 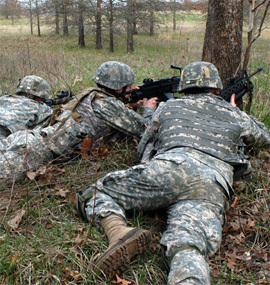 Now think back to the time you and your buddies were pinned while conducting an assault. The rest of your team has lost its forward momentum and is taking unbearable casualties. It’s just you and a few of your fireteam members huddled together, only meters away from the enemy line. Retreat seems hopeless because you’ll expose yourself to withering enemy fire, and you cannot coordinate with the rest of your quickly depleting force to move left or right. There are only two choices left – sit here and be picked off one-by-one, or charge forward into a certain wall of fire. Insane. Desperately you turn to your few buddies and say, “On the count of three.” And it’s one, two, three! With a vicious yell you charge fifteen meters forward and catch an opponent off guard, then another. A heartbeat later you’ve taken the enemy position and your buddies are firing back into the enemy line. The answer is the phenomenon known as violence of action (VOA). This is the exact opposite of the bunker-down effect. While an experienced tactician recognizes that such a desperate charge could have just as easily ended in catastrophe for your fireteam, in this case it worked because you surprised the enemy. Surprise? The enemy, after all, knew exactly where you were. They had been pouring on suppressive fire just moments before your charge. Yes. But they had not anticipated (and readied themselves) for your violent charge forward. They expected your fireteam to take another course of action, and your charge forward caught them off guard. The inability to react to an enemy’s action is also an element of surprise. More to the point, your application of VOA at the local point of engagement had a more generalized effect on the entire enemy’s defense. But why? The simple answer is perception. Perception is a fickle thing that can change at the blink of an eye. It may be that the enemy thought they had the upper hand. Or it may be that they had no idea of their devastating effect on the assaulting force. Whatever the case, when your fireteam managed to seize a foothold within their defensive line, their perception changed. The enemy now began to see themselves on the losing end of the engagement. Too, it is very difficult to place effective fires within one’s own defenses, so your opponent decided it was time to fall back and yield the terrain to you. This all happened almost instantly. And the single greatest contributing factor was the violence with which your fireteam displayed in your attack forward. In a very real sense, VOA renews or continues the forward momentum of the engagement. VOA is a combat multiplier. It is not a silver bullet. Good tactics and successful engagements still rely on careful planning and an excellent mastery of battle drills. Still, when engaging an opponent, or engaged by an opponent, the immediate application of extreme violence lends a ferocious momentum forward that is irresistible. Nine times out of ten, this VOA dominates the engagement because the enemy is caught by surprise – regardless of how ready they think they are! So, in addition to planning and well-rehearsed battle drills, VOA is a factor in determining success, more commonly than not. 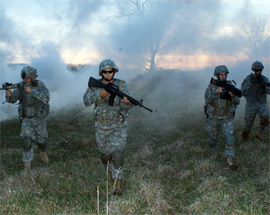 If you were to break down the variable components of a successful implementation of VOA, you would notice that VOA is most effective when (1) you mass your force at a local point that outnumbers the enemy force, (2) you maneuver your force violently forward, and (3) your actions have caught the enemy by surprise. The last element of a successful implementation of VOA is the enemy’s perception. Yes, the enemy gets a ‘vote’, too, and perception can be very fickle. It may work in your favor, or against you. This fourth variable is the unknown – you cannot control it, only your opponent can. When we analyze the military objective of conflict, it comes down to imposing our will over an enemy force. For small unit tactics, this relies heavily upon the implementation of violent acts, and VOA is the forward momentum of our action. When employed by smaller units against a superior sized enemy force, VOA is a combat multiplier.